How the ECB killed Spain (Slate). Unemployment, downsizing, and devaluation (The Atlantic Monthly). Remembering film critic Andrew Sarris (The New Yorker). Barbarella to get her own TV series (Vanity Fair). Is Cue the cure for information overload? (Bloomberg Businessweek). What makes Iranians tick? (Lowy Interpreter). Transnational security threats (The Conversation). Investment author interviews (Abnormal Returns). I have a piece up at The Conversation on new research into transnational security threats. It discusses ethnic conflicts, terrorism, and weapons of mass destruction. My thanks to Associate Professor Chris Riedy for the invitation to contribute to the Millennium Project series, and to Conversation editor Matthew Thompson. Strategic investing using exchange trade funds (Reading The Markets). The party indicator for investors (The Reformed Broker). The goodwill tour to Wall Street of US Senator Chuck Schumer (The New Republic). News Limited makes $A1.97b bid for Consolidated Media (ABC). Journalists as media-owners (Core Economics). Julian Asssange seeks political asylum in Ecuador (Wired, The Guardian, The Atlantic Monthly). Iran nuclear talks downgraded (The Guardian). US cyber-attacks on Iran nuclear weapons development program (Washington Post). Brown’s insight applies to academic blogging: it’s the cognitive training that matters rather than if the work is read by others. “Blogging is not a side gig, it is the method by which I’m becoming what I want to become for myself and for those I’m responsible to,” Brown notes. Blogging forces Brown to be across daily events, global macro moves, and to understand different asset classes. It focuses his investment advice to clients and idea generation process. Importantly, blogging has enabled Brown to stop doing many activities. Follow Brown on Twitter and read about his social media use. In contrast to Brown, I know academics who can go months without writing a journal article or doing research. They might be more productive if they embraced Brown’s blogging approach and his daily writing regimen. How Google decides what stays in searches (The Atlantic Monthly). Political chaos in Egypt (The National Interest). Investment managers at-risk of disruption (Abnormal Returns). John Cassidy on Greece (The New Yorker). Ben Eltham on Fairfax (New Matilda). Google’s Knowledge Graph is going to catalog the internet (The Atlantic Monthly). Isaac Chotiner hates Jonah Lehrer’s Imagine (The New Republic). Jonah Lehrer on Daniel Kahneman (The New Yorker). Fairfax cuts 1900 staff; FXJ share price rises (The Age). Ben Eltham on the Fairfax cuts (ABC). Imagine Entertainment to adapt George Orwell’s 1984 (Deadline). How to get a job in academia when you finish your PhD (The Thesis Whisperer). Cocaine Incorporated (New York Times Magazine). 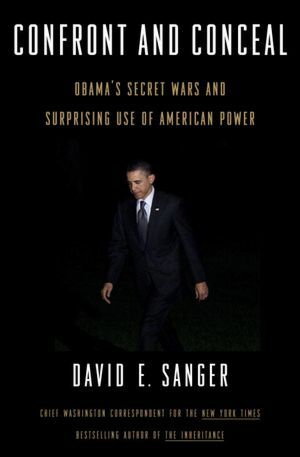 David Sanger’s new book Confront & Conceal reveals that the United States has developed an offensive cyberwarfare capability – code-named Olympic Games – for deterrence and denial of Iran’s nuclear weapons development program. 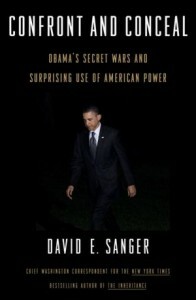 The reaction to Sanger’s book has renewed debate about cyberwar doctrines and the internet’s safety. Slate‘s Fred Kaplan suggests that policymakers who formulate new cyberwar doctrines can learn from the 1950s and 1960s body of theory-building in nuclear strategy. Meanwhile, Atlantic Monthly‘s Patrick Lin, Fritz Allhoff and Neil Rowe wonder if cyberwar can be waged in a ‘just war’ framework. I suggested in 2010 that for Australia, an offensive cyberwarfare capability may lead to counterforce targeting by more equipped nation-states. I have a special affinity for Ridley Scott’s Alien universe. At 5, my step-mother accidentally gave me Richard J. Anobile’s Alien photo-novel. The ‘chestburster’ death of Kane (John Hurt), the discovery that Ash (Ian Holm was a robot; and the deaths of Parker (Yaphet Kotto) and Lambert (Veronica Cartwright) impacted me. I saw the film poster but didn’t see Alien until years later. In undergraduate college I attended a seminar by feminist film academic Barbara Creed who interpreted Kane’s death as a fear of male birth. Later, I wrote about the Swiss conceptual artist H.R. Giger and psychologist Stanislav Groff for the Disinformation website. For an unused Disinformation site category called Dark Renaissance, I envisioned the kind of darker culture seen in the Alien films, and in the Dark Knight, Matrix, and Underworld film franchises. In Alien the USS Nostromo mining refinery intercepts a distress call from the planet LV-426. The crew discover a derelict space craft and a chamber with a dead crew member dubbed the ‘Space Jockey’. Scott’s prequel Prometheus is a ‘first contact’ story between humans and the ‘Space Jockey’ race: engineers who terra-form planets and develop biomechanoid weapons. As with the early Dark Horse comic series Prometheus opens up the Alien universe beyond the narrow confines of later films like Alien v Predator: Requiem. Prometheus opens with an Erich von Daniken-style prologue in which an Engineer ingests an alien spore, dies, and seeds Earth with life. In 2089, archaeologists Elizabeth Shaw (Noomi Rapace) and Charlie Holloway (Logan Marshall-Green) discover 30,000 year-old star maps on the Isle of Skye. The star maps correspond to star maps in six other ancient civilisations that Shaw and Holloway have found. They convince Peter Weyland (Guy Pearce) to fund a trillion dollar scientific expedition to the planet LV-223 in order to “meet our makers”. On 21st December 2093 the spacecraft Prometheus arrives at LV-223. The android David (Michael Fassbender) awakens the crew which includes Shaw, Holloway, and Weyland representative Meredith Vickers (Charlize Theron). Weyland briefs the team in a scene reminiscent of Hari Seldon in Isaac Asimov’s Foundation trilogy (1951-53). The first third of Prometheus echoes Alien: interiors that anticipate the USS Nostromo; similar landing procedures; the discovery and investigation of a hollow pyramid-like structure; similar shots of dead alien lifeforms; and crew battles over possible contamination. David opens the door to an egg-like chamber just like Kane discovers one in the derelict spacecraft. The audience at the second screening I saw kept looking at the cylindar-like eggs and the crew, in anticipation. Alien is in some ways about Frank Knight‘s distinction between foreseeable, observable risks and unforeseeable uncertainties. The Nostromo crew struggle to contain the alien lifeform that they think is a risk and that evolves through its lifecycle into an uncertainty. Their improvised actions fail because they are dealing with a Black Swan risk: a low-probability, high-impact event. Ripley (Sigourney Weaver) and Ash’s revelation about Weyland-Yutani’s Special Order 937 reveals that the crew are part of a deeper game about biomechanoid weapons acquisition. The crew are expendable. In contrast, Prometheus is more about the adverse effects of religious beliefs as decision/psychological frames and the conditions under which Bayesian inference can fail. Shaw is motivated by her father’s death from Ebola and Christian, Creationist-like beliefs about gods. Holloway is motivated by scientific adventure and the opportunity to answer existential, philosophical questions. Both are “true believers” notes Vickers and this gives them a kind of naivete which affects their judgments. Weyland is “superstitious” according to Vickers and fears death. All three are driven by their beliefs and unable like Bayesians to update them on the basis of new information. But unlike Nostromo the Prometheus crew is aware of risks: geologist Fifield (Sean Harris) and biologist Milburn (Rafe Spall) leave the main crew because they are scared; Shaw warns crew members not to touch the cylindars and also decides to leave; and Vickers kills Holloway when he is infected and endangers the spacecraft. Vickers even cites risk management principles as the crew prepare to land on LV-223. “I like to minimise risk,” she explains. The crew correctly diagnose risks throughout Prometheus but lack the decision-making processes to act in a timely and efficient manner. Weyland, Shaw and Holloway’s religious beliefs mismatch LV-223’s actual conditions and the Engineers’ agenda. The mistakes are also due to cognitive biases and decisions under uncertainty or misjudgments that have interested behavioural economists. “This is a scientific expedition: no weapons,” Shaw tells the crew, in a misjudgment about the likely use of force. Shaw accidentally leaves an Engineer head outside the spacecraft and injures crew during a storm; Fifield and Spall ignore the precautionary principle and investigate the cylindars’ black liquid; David acts on Weyland’s demand to “try harder” and infects Holloway; and captain Janek (Idries Elba) dispatches crew to meet a mutated Fiefield who then kills them. Shaw also survives a medical procedure that is as clinical and grotesque as Kane’s ‘chest-burster’ death. Slate‘s Dana Stevens observes that the Prometheus crew are “not smart” but this is in part a failure of situational awareness. More deeply it is a failure to engage with the Unknown. Prometheus‘s final act echoes Alien in a series of escalating crises. Janek speculates that LV-223 was the staging ground for biomechanoid weapons that turned against the Engineers. Weyland’s awakening directly recalls the aging David Bowman (Keir Dullea) in Stanley Kubrick’s 2001: A Space Odyssey (1968). “A king has his reign, and then he dies,” Vickers tells Weyland, in a line that echoes anthropologist James Frazier. “That’s the natural order of things.” Weyland, Shaw and the remaining crew then decide to meet the last living Engineer. Shaw seeks to understand why the Engineers targeted Earth whilst Weyland desires apotheosis into immortality. The encounter could have been more provocative but ends abruptly in violence which includes David’s decapitation that echoes Ash’s death. Vickers leaves Prometheus in a scene reminiscent of Ripley’s escape in the Narcissus shuttle craft, as Janek decides to crash the Prometheus into the Engineer’s craft. Shaw’s return to the craft to battle the Engineer and the alien recalls Ripley’s final battle with the xenomorph, as do Shaw and Ripley’s different, final messages. 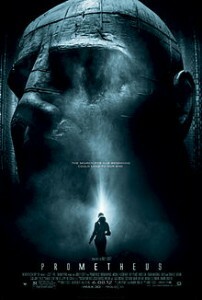 Prometheus is almost like an Alien remake. Shaw’s Christian beliefs give her an evolutionary advantage: a survival instinct and psychological resilience. David and Shaw end Prometheus with greater creative horizons. The first screening of Prometheus that I saw made an impact on me. Giger’s biomechanoid vision, the costumes, art design and production design were all evocative. The second screening had less of an impact. Unlike other reviewers, I was not that concerned by the film’s philosophical musings (which didn’t go far enough for me), the intertextual references to other films, the crew’s mistakes, or the third act (which closely echoes Alien in structure). Instead, I found that Marc Streitenfeld’s music, Dariusz Wolski’s cinematography, and Pietro Scalia’s film editing all signposted the shocks and set pieces. The contact meeting with the last living Engineer fails because there is no real opportunity for communication. I trace these problems back to Jon Spaights’ original script; Damon Lindelhof’s tendency for oblique symbolism; and Ridley Scott’s navigation of studio pressures to deliver an Avatar-like blockbuster. 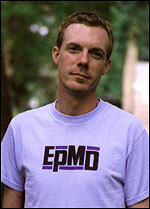 Scott often talked about an Alien 5 that would return to the Engineers’ home planet. Spaights and Lindelhof might do better to look at the homeworld scenario in the Dark Horse comic Aliens: Outbreak (1988) and the role of religious cults and scientific researchers in bringing the xenomorphs to Earth. Alternatively, they could spin-off a story on the Weyland-Yutani merger with the interception of Shaw’s final message and the origins of Alien‘s Special Order 937 as a narrative arc. Get Final Draft ready for your spec script. I can supply the nightmares. No matter how much the journalists protest about “quality”, the hard facts remain. Fairfax’s newspapers will have to be slimmed down even more quickly than they already are, while new revenue sources in the digital space will have to be conjured up. Under Greg Hywood, there seems every sign that at last management “gets” this, and is moving aggressively to implement the necessary changes. This is the unmistakeable logic behind the decision to remove 66 sub-editors from newspapers in Newcastle and Woollongong, to be replaced by staff in New Zealand, where presumably they will work for less. Call it outsourcing, call it offshoring — call it common sense. Hywood and his team are doing what most listed corporations would do when faced with a high-cost part of their business with rapidly declining revenues. They’re slashing costs. They’re looking for ways to deliver the same product more cheaply. Offshoring sub-editorial jobs has been on the cards for a decade. John Hagel III and John Seely Brown’s book The Only Sustainable Edge (Boston: Harvard Business School Press, 2005) situated offshoring as a cost-cutting option amidst the “accelerated capability building” that would underpin sustainable competitive advantage. For Hagel III and Brown, offshoring helped firms to engage in “dynamic specialization”: “the commitment to eliminate resources and activities that no longer differentiate the firm and to concentrate on accelerating growth from the capabilities that truly distinguish the firm in the marketplace” (p. 54, emphasis added). This argument resonated with a broader debate about disruptive innovation and also with the 2003-07 growth of emerging markets and exchange traded funds for international investors. Eltham’s arguments also do not contradict a 2009 study that I co-wrote with Barry Saunders on journalists as ‘investigators’ and ‘quality media’ reputation. Saunders and I studied a cohort of 20 journalists who differentiated themselves with investigative skills from other domains. For example, Bethany McLean who broke the Enron scandal had Wall Street investment bank experience. Media outlets like The New Yorker and The New York Times built their ‘quality media’ reputation also through fact-checking, editorial, and legal processes, and through a Classical Hollywood-style star system of journalists. NYT journalists are often featured on PBS Frontline documentaries, for instance. Finally, our study coincided with a debate about philanthropic foundations and grant-making as a funding model for quality journalism. Fairfax has not followed the study’s advice. Neither have the striking Fairfax journalists. Regrettably, many of New Matilda‘s readers also missed Eltham’s insights about Fairfax’s market valuation. It’s vital to understand the role of structural economic factors, debt/equity ratios, and labour market bargaining in assessing the possible futures of newspapers. Institutional investors also influence Fairfax’s management. Fred Hilmer’s memoir The Fairfax Experience: What The Management Texts Didn’t Teach Me (Milton: John Wiley & Sons Australia, 2007) reveals that he spent almost half his day at Fairfax dealing with financial issues and meeting with institutional investors. The same week as the Fairfax journalists’ strike, investor Gina Rinehart continued her bid to control Fairfax’s board. Rinehart’s tactics reflect Carl Icahn‘s ‘activist investor’ strategy (presentation). However, these insights are often taught more in mergers and acquisitions courses than in journalism school. Fairfax’s share price was range-bound on 30th and 31st May before dropping on 1st June. It’s difficult to show that the Fairfax journalist strike was a causal factor that convinced investors to sell Fairfax’s stock. The strike may have created an opportunity for short-sellers and event arbitrageurs. Macroeconomic uncertainty in China, India and the United States broadly affected the Australian financial markets. The month’s end also meant portfolio rebalancing by fund managers. What could striking Fairfax journalists do? Visit SalaryTutor.com. Read The Lean Startup and The Startup of You. Develop a personal competitive advantage, and several back-up plans. You will face a more lean newsroom environment.